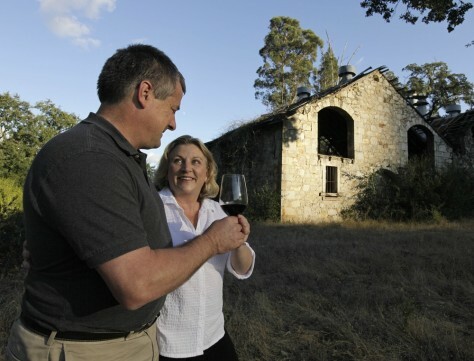 Richard and Leslie Mansfield pose by the Franco-Swiss ghost winery they are renovating Oct. 6 in St. Helena, Calif. The winery was founded by three men who met while working at Charles Krug and by 1884 was producing 100,000 gallons of wine annually. But it was forced to shut down by the early 20th century due to Prohibition.